A sprain occurs when a joint is stretched too far — causing stretching or tearing of ligament tissue that holds the joints together. Finger sprains, or “jams,” are one of the most common injuries in hand-focused sports, like basketball or volleyball, or sports where falls on hands are common, like football. To understand finger injuries and when you need to treat them, it is important to be familiar with the basic anatomy of the finger. The finger has three joints: the metacarpal phalangeal joint (MCP joint) or big knuckle, the proximal interphalangeal joint (PIP joint) or the middle knuckle, and the distal interphalangeal joint (DIP joint) or the small knuckle at the tip of the finger. Each joint has ligaments on the sides, called collateral ligaments, that are often injured when fingers are hit from the side or landed on, and on the palm side, which get injured with hyperextension of the fingers. After an injury, there will be pain, swelling and often stiffness or difficulty moving the finger. See a doctor immediately if the finger is obviously out of place, crooked or misshapen, cold, pale or numb, or if swelling and/or severe pain developed immediately within the first 30 minutes after the injury. With minor injuries, typically the finger can be treated with RICE principles (rest, ice, compression and elevation). 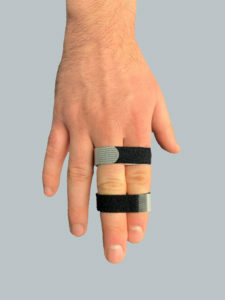 Another helpful treatment is to buddy tape the finger to the adjacent finger for increased stability. To do this, hold the injured finger next to the finger beside it, and tape them together; wrap the tape around the fingers (not too tightly) at the base of the finger and above the PIP joints (not over the knuckles). Placing thin foam between the fingers can also protect the skin. Buddy taping should allow some gentle movement, bending and straightening, so the fingers do not get too stiff. If pain and swelling symptoms do not improve significantly after 48 to 72 hours of conservative treatment of RICE principles and buddy taping, you should make an appointment with your physician. We often see patients who let an injury go for several months with stiffness and pain. Once the finger is stiff for several months, it can take several weeks or even months of therapy treatment to regain motion and function. When you go to the doctor, try to remember as much as possible about the original injury. For example, did you hear a pop or snap, and was the finger immediately swollen or misshapen. This can give the doctor important information about your injury. Treatment can include X-rays to check for broken bones and to evaluate the joint as well as looking for increased space or bones that are not aligned, which can indicate more severe sprains. There are many finger injuries that will heal on their own, especially with care, rest and treatment at home. But it is important to see a doctor quickly when it is more serious to ensure the quickest recovery — leaving a serious injury for too long can make it very difficult to heal and regain full function. 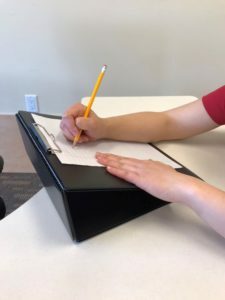 To find out which MOTION locations offer hand & upper extremity center services, visit https://motionptg.com/services/occupational-therapy/hand-upper-extremity-center/. “My passion is working with children, seeing their progress and seeing them benefit from our therapy. What a child learns in therapy also affects the family, getting the whole family involved in the process,” said Katie Johnson, MOT, OTR/L, MOTION pediatric occupational therapist. 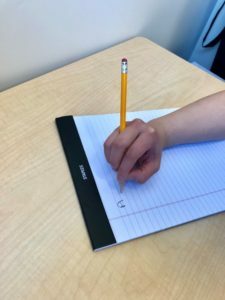 Johnson has been working in the field of pediatric occupational therapy for the past five years, after graduating from a dual Bachelor of Science and Master of Occupational Therapy program at Quinnipiac University in Hamden, Connecticut. Johnson’s typical day may consist of working with children with autism and developmental delays as well as those with various neurological disorders. They work on motor-planning activities, sensory integration, strengthening exercises and improving activities of daily living (ADL), like tying shoes and getting dressed. MOTION offers a fun and safe setting for pediatric therapists to evaluate and treat their patients. All of MOTION’s pediatric gyms are equipped with a variety of games and equipment to facilitate the best treatment for every child. A customized treatment plan and goals are determined with the therapist and the child’s family, and updates to the plan are made based on the child’s progress. Family participation is an essential part of the treatment. 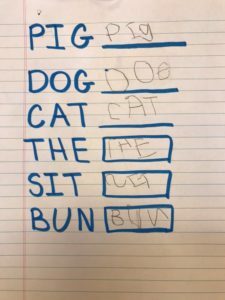 “Continued practice of new skills and treatment techniques in the child’s natural environment at home is crucial in order for the child to master the skills and then generalize them into their daily routines,” Johnson said. And one thing there’s a lot of: play. 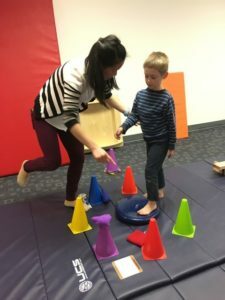 MOTION’s pediatric occupational therapy services, visit: https://motionptg.com/services/occupational-therapy/pediatric-occupational-therapy/. In order for babies to grow in a healthy way, it’s essential for them to spend time on their tummies. Tummy time can start as soon as they come home from the hospital. It helps stretch the front muscles and strengthen the head/neck, shoulder, back, abdominal and hip muscles, all of which are needed to maintain proper alignment, movement and balance. Most importantly, tummy time can prevent serious issues such as plagiocephaly (flat head syndrome) and torticollis (tightness and/or weakness of the neck). Ready to get your baby playing on their tummy? Below is a guide to help you navigate through the ins and outs of tummy time. Never leave your newborn infant unattended on their tummy. Your baby may not be strong enough to lift their head up to breathe. Do not put your baby to sleep on their stomach. Your newborn will not tolerate tummy time for long periods of time. Some babies may only tolerate it for 10 seconds to one minute. Read your baby’s signals. They will let you know when they are tired of playing on their tummy. 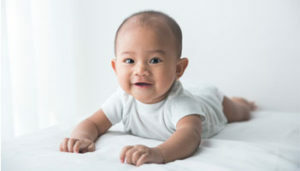 Incorporate tummy time into your general routines: diaper changes, massaging, burping on your lap. Short sessions throughout the day work well based on tolerance and temperament. Many newborns prefer tummy time on their parents’ stomachs or chests rather than the floor. Try lying down on your back and place your baby on your chest or stomach. Sing and talk and encourage your baby to look at you. A baby-proof mirror may also help encourage your baby to look up at themselves. Placing your baby on blankets with different textures will enhance their sensory experience while they play on their tummy. You can read more about child growth in my new book, Why Motor Skills Matter: Improve Your Child’s Physical Development to Enhance Learning and Self-Esteem. Pediatric care is just one of the many subspecialties we offer at MOTION. Our pediatric team understands every child’s needs are unique. We are compassionate, creative and adaptive to meet the needs of your child. Our results are improved skills, performance and a happier child. At MOTION, we are family-focused and provide one-on-one therapy and group sessions when it is right for your child. We see a wide range of children from infants through adolescents with mild delays to genetic syndromes, sensory processing disorders, neurological disorders, orthopedic concerns and sports injuries. All babies learn from experience. It is our job to help babies move to improve learning and self-esteem. We help to enhance mobility, stability and sensory processing so a child can participate effectively at home, school and with their peers. Things that may seem unimportant or insignificant can turn into long-lasting developmental issues such as torticollis, toe walking and mild delays. If you have concerns about your child’s development, please consult your pediatrician or primary care physician. At your doctor’s request, we will implement a plan of care and treatment protocol for your child. We provide a full range of physical, occupational and speech therapies to work toward achieving family goals. Jessica Colon is the mother of 20-month-old Christopher, who was diagnosed at birth with congenital muscular torticollis (CMT), a one-sided shortening of the sternocleidomastoid (SCM) muscle that runs along both sides of the neck and from the back of the ears to the collarbone. It can result from positioning in the womb or after a difficult childbirth. Along with the torticollis, Christopher also had plagiocephaly, or a flattening of the skull. He had a difficult time turning his head, wasn’t crawling and had overall extreme weakness on his right side. He had very poor core muscle strength and had other physical delays. Early intervention is key for a quick recovery and prevention of further functional problems as a child grows. When Christopher was about four months old, Jessica found Cranial Technologies, a clinic solely dedicated to treating infants with plagiocephaly. They evaluated Christopher and put him in the DOC Band, a custom cranial helmet. It was Cranial Technologies who encouraged Jessica to also find a pediatric physical therapist who could work with Christopher on strengthening his weak motor skills and help correct his physical behaviors. 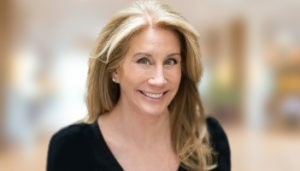 Tara Liddle has been a pediatric physical therapist for more than 30 years, and she is the regional director of pediatric therapy at MOTION, Inc. She received her bachelor’s degree in physical therapy and master’s degree in physical therapy management of developmental disabilities from New York University. The primary goal of early intervention is to restore full neck movement as early as possible as well as stop or reverse the progression of skull deformities. 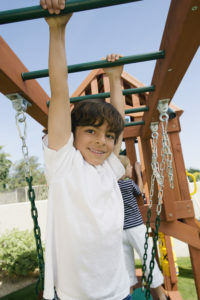 Liddle worked to improve Christopher’s symmetry and focus on age-appropriate gross motor development. While he still has some challenges ahead, Christopher is now on the right path, thanks to Liddle and his mom’s push for early intervention. While currently pursuing a doctoral degree in pediatric physical therapy, Liddle is a frequent speaker at hospitals, schools and parent groups. She is also the author of a new book, “Why Motor Skills Matter,” exploring the importance of touch, movement and play in the neurodevelopment and well-being of children birth through age five. Tara Losquadro Liddle, MPT, the regional director of pediatric therapy at MOTION, Inc., is the author of a new book exploring the importance of touch, movement and play in the neurodevelopment and well-being of children birth through age five. “Why Motor Skills Matter: Improve Your Child’s Physical Development to Enhance Learning and Self-Esteem” explains the impact motor skills have on the emotional, social and cognitive development of a child. Liddle has been a pediatric physical therapist for more than 30 years, and she is the regional director of pediatric therapy at MOTION, Inc. She received her bachelor’s degree in physical therapy and master’s degree in physical therapy management of developmental disabilities from New York University. One of Liddle’s patients, Christopher, was diagnosed at birth with congenital muscular torticollis (CMT), a one-sided shortening of the sternocleidomastoid (SCM) muscle that runs along both sides of the neck and from the back of the ears to the collarbone. He also had plagiocephaly, or a flattening of the skull. He had a difficult time turning his head, wasn’t crawling and had overall extreme weakness on his right side. Christopher’s mother, Jessica Colon, knew early intervention was key, and Liddle came highly recommended. Currently, Liddle is pursuing a doctoral degree in pediatric physical therapy. She is also a frequent speaker at hospitals, schools and parent groups. “Why Motor Skills Matter” can be purchased on Amazon here.